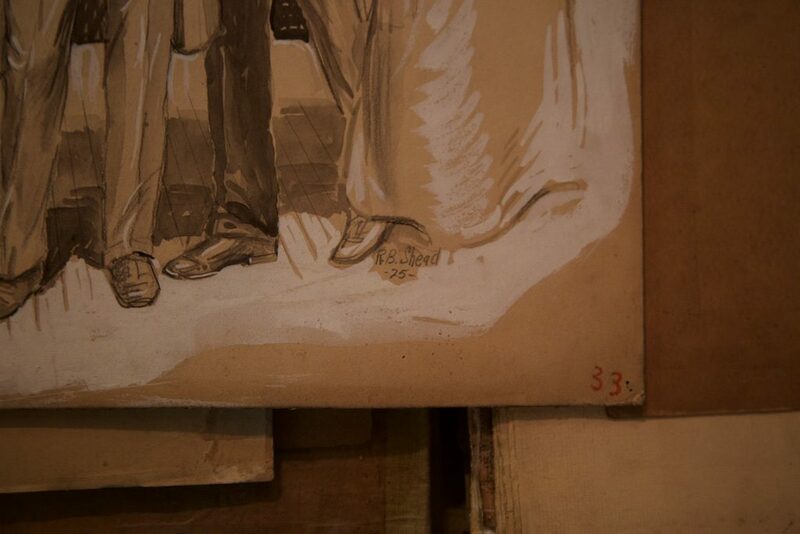 I was finally able to go back with my camera and take better photos of the paintings as well as look at these new finds. 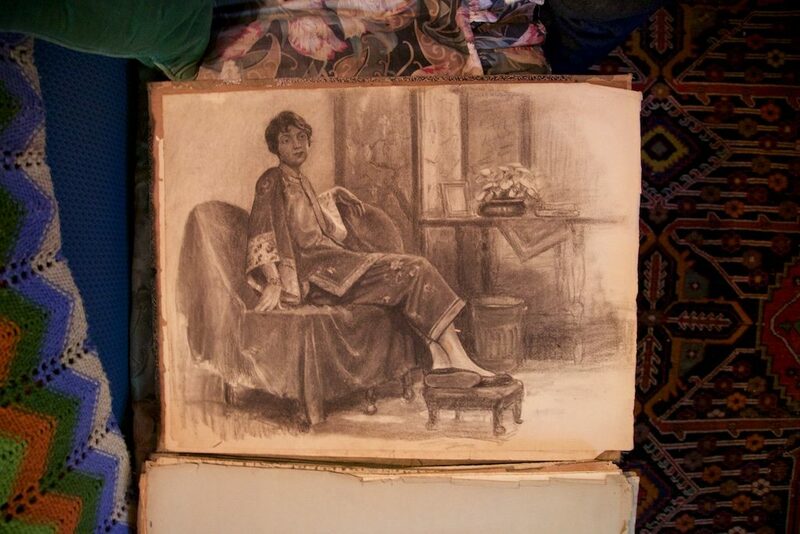 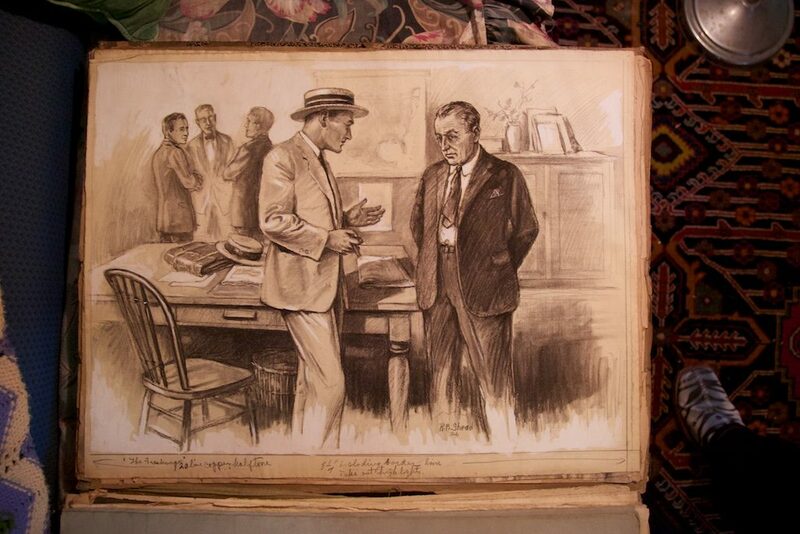 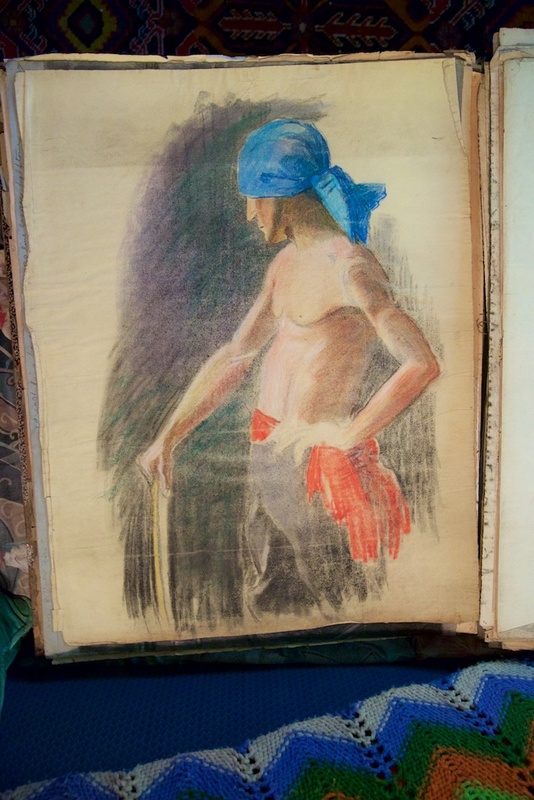 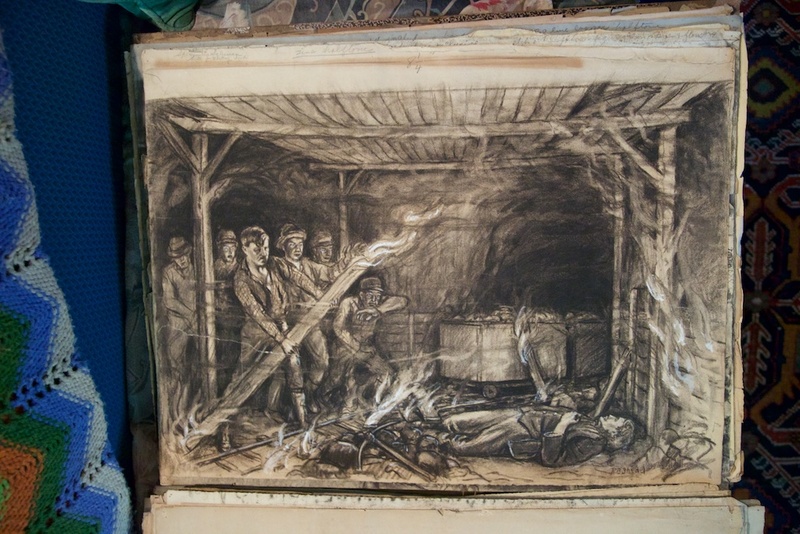 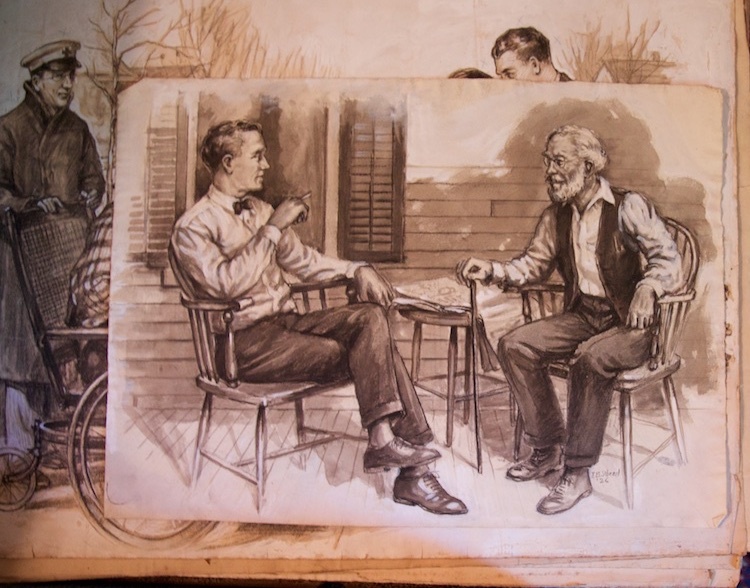 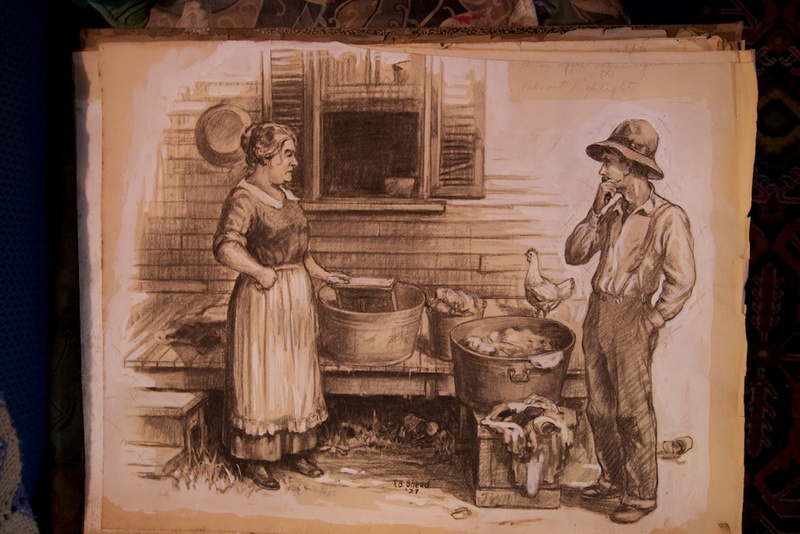 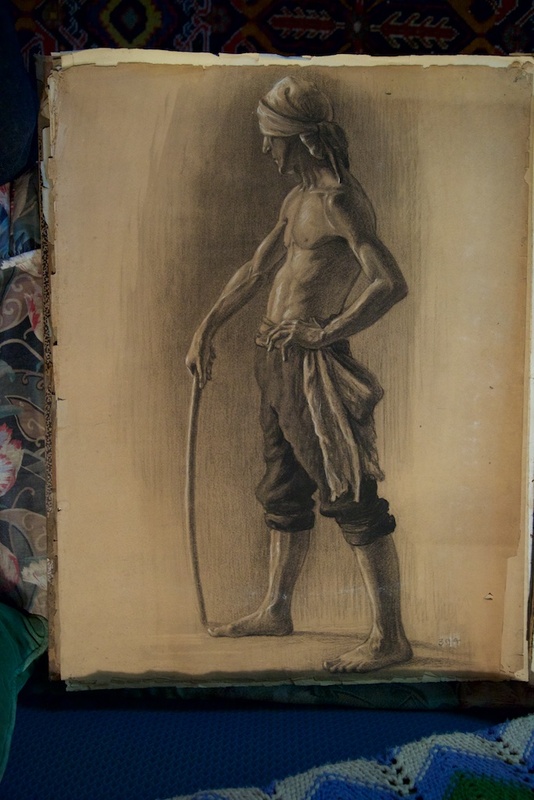 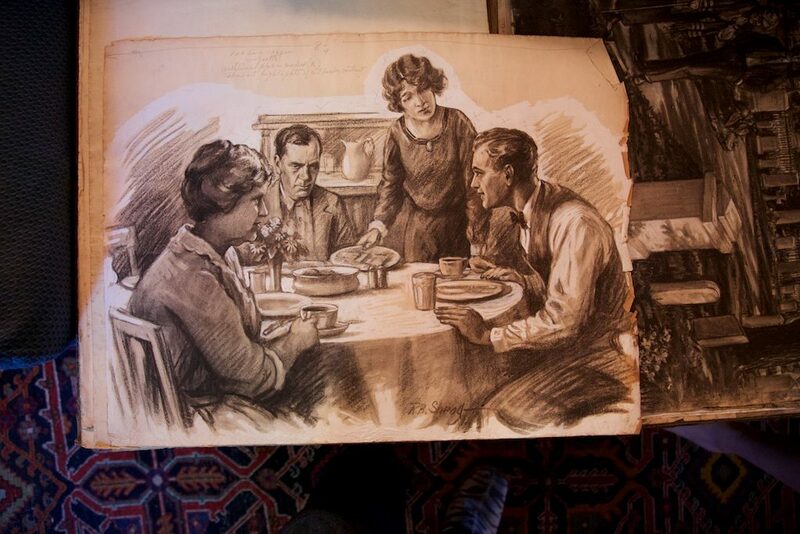 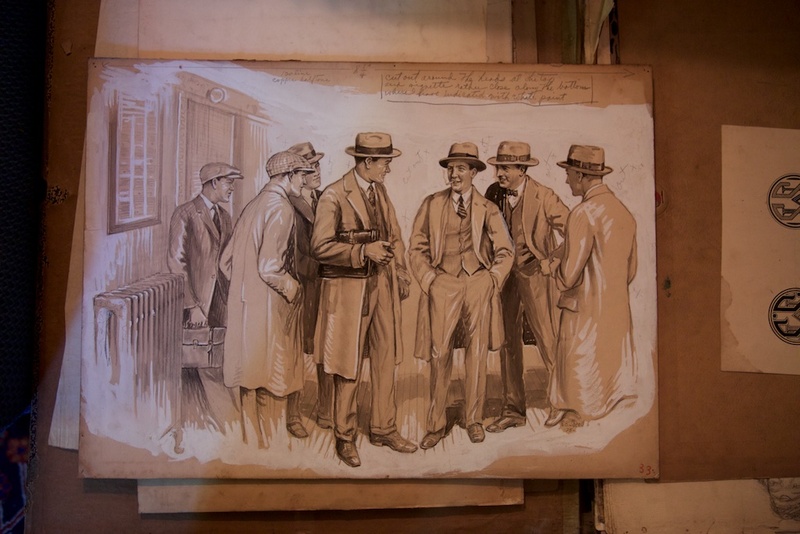 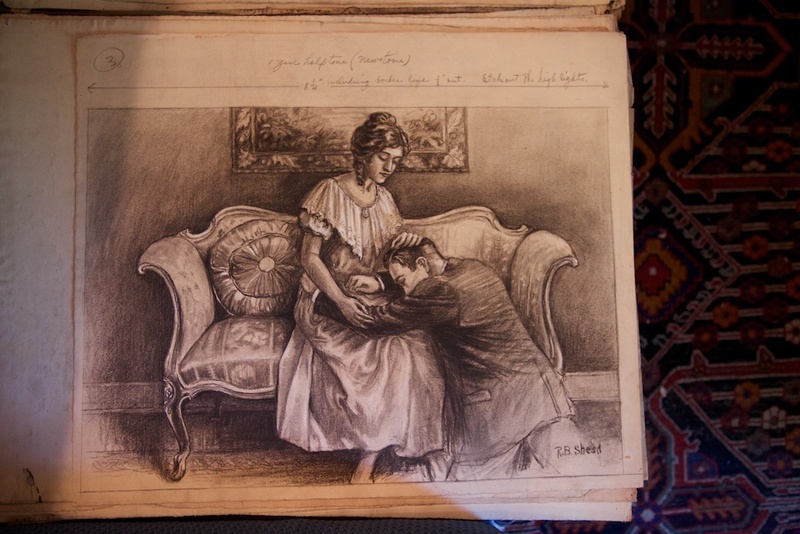 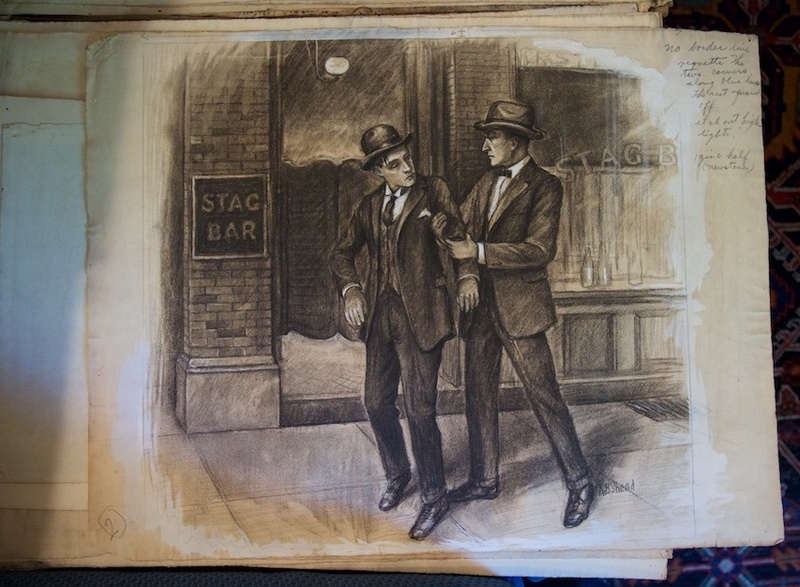 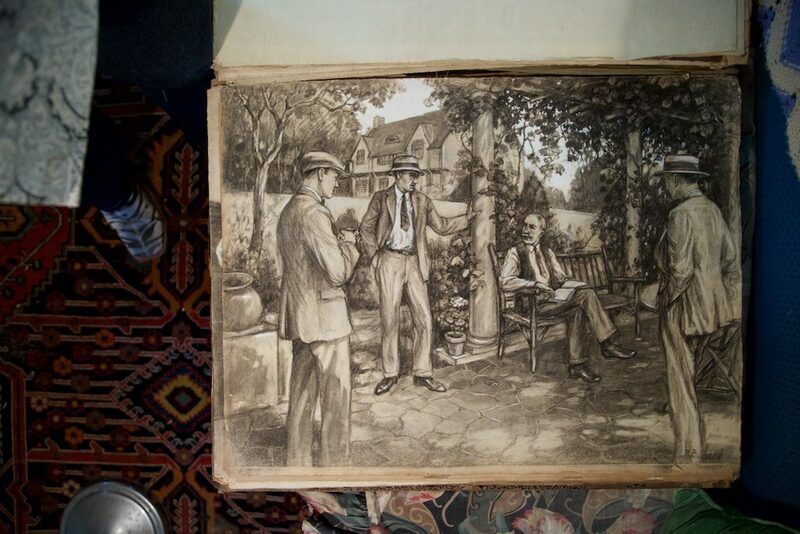 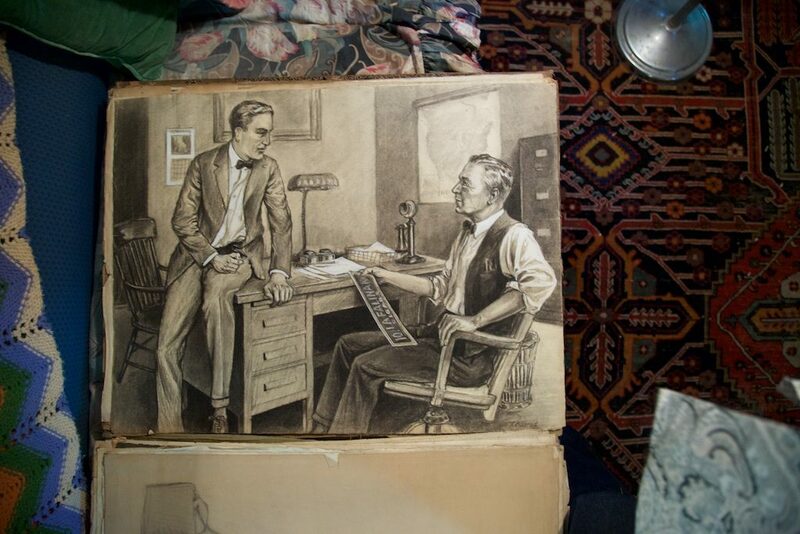 Those “few” sketched turned out to be an enormous century-old portfolio filled with over 100 pieces of art that Ralph had done either for story illustrations, studies, or magazine cover layouts. 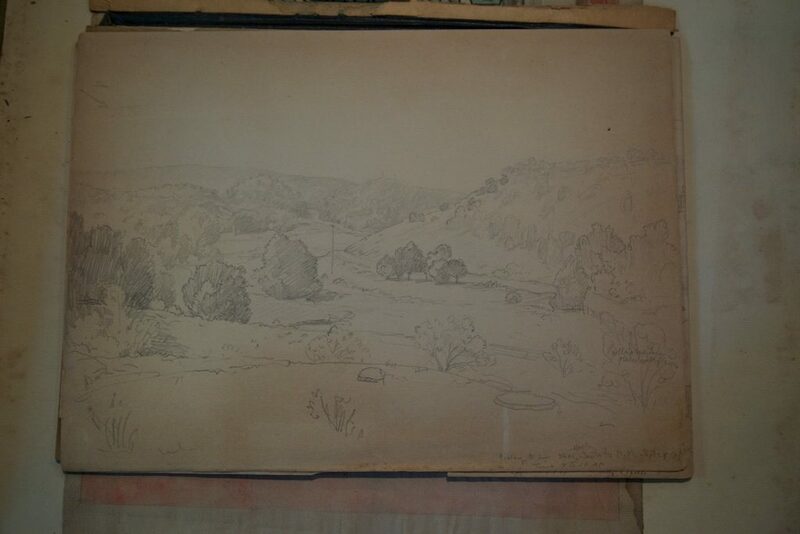 I was in awe. 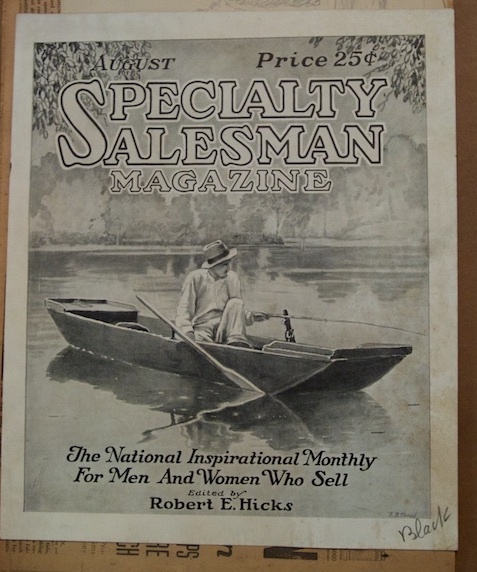 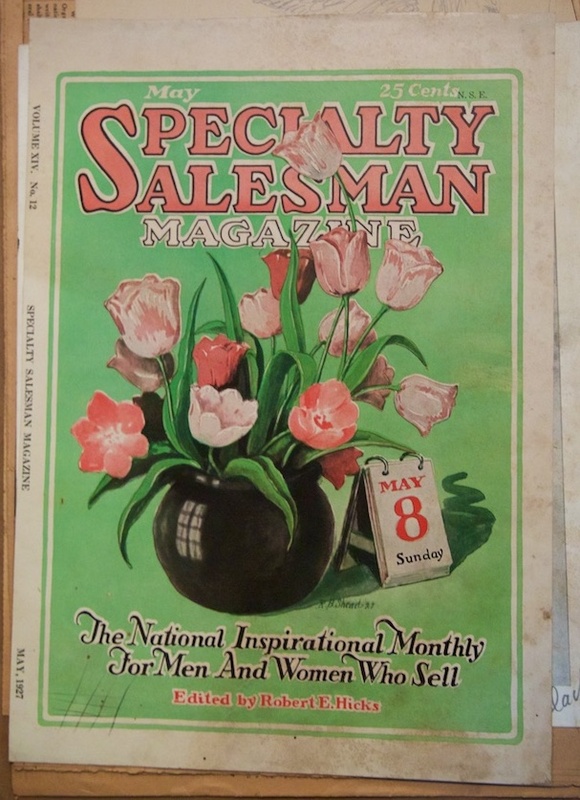 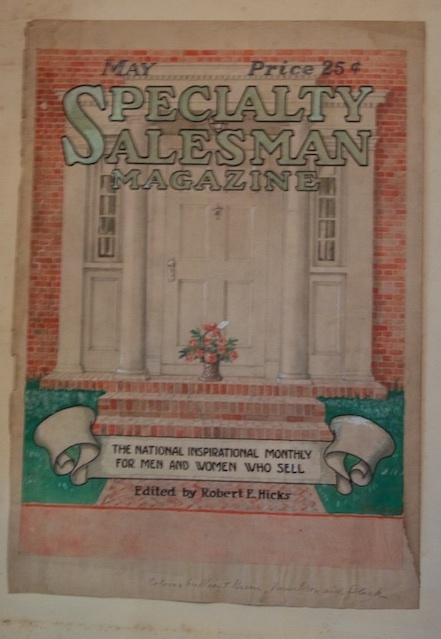 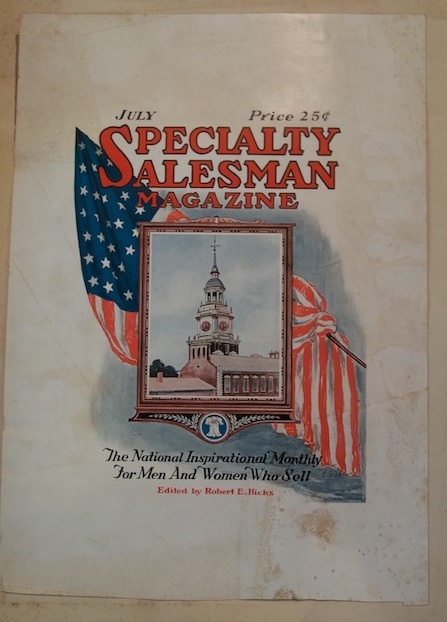 The magazine covers were layout for The Specialty Salesman: The National Inspirational Monthly for Men and Women who Sell. 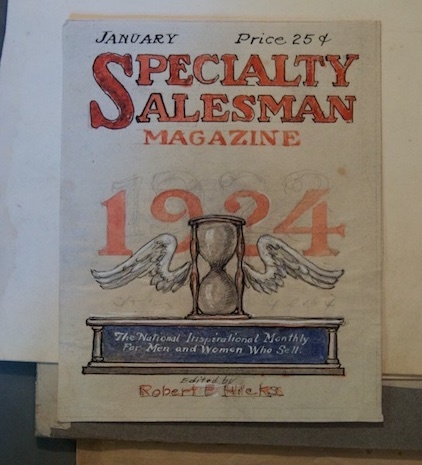 The earliest cover layout was the January 1924 issue. 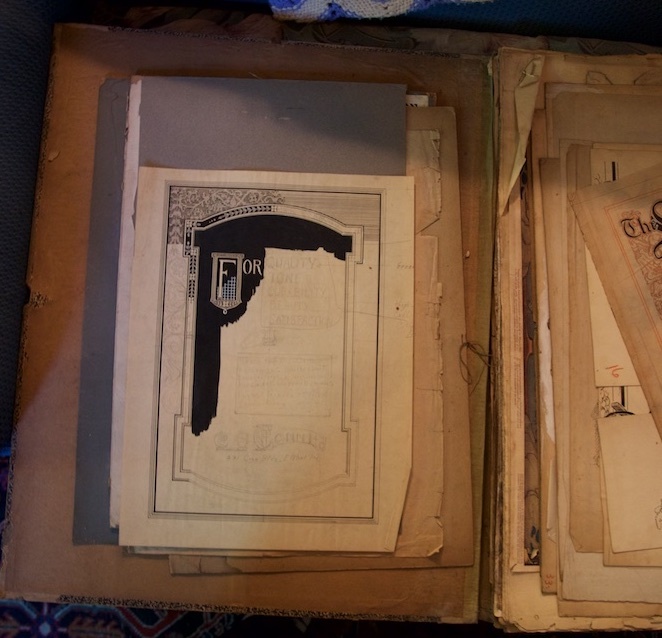 I have no idea if these are the same ones that include the illustrations, but I have three years worth (12 months collectively bound) requested through interlibrary loan to find out. 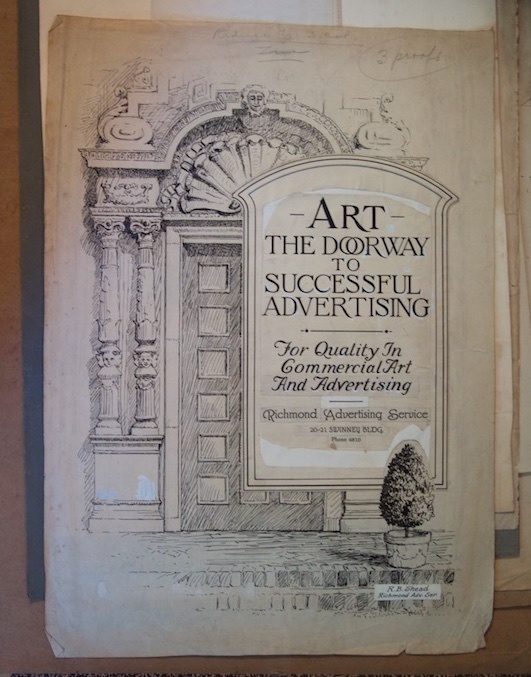 Other covers included a music journal and an advertising flyer for the ad service that Ralph was working for in Fort Wayne, Indiana. 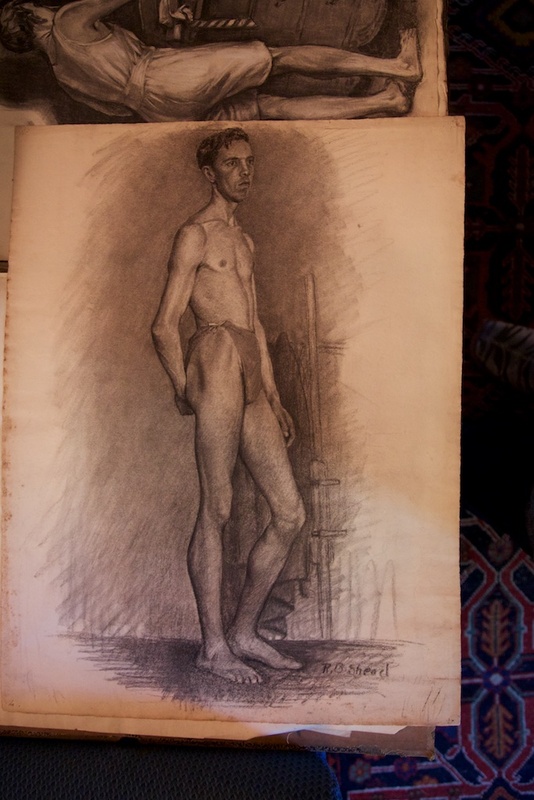 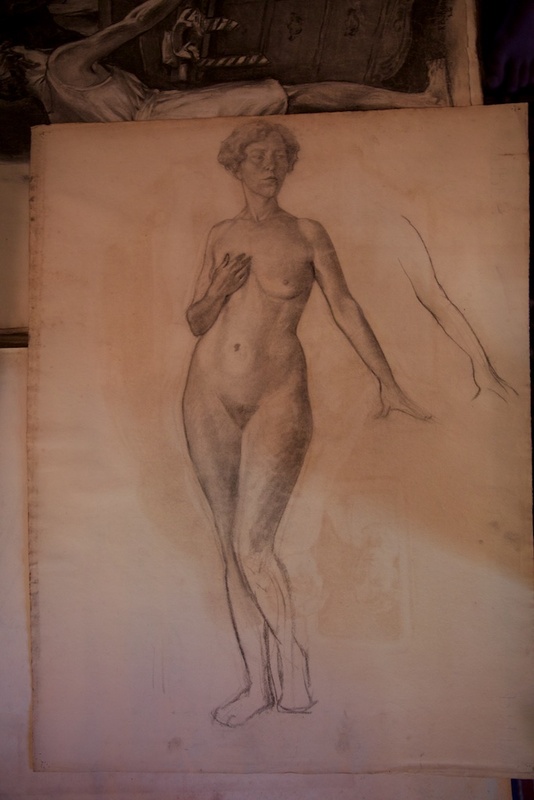 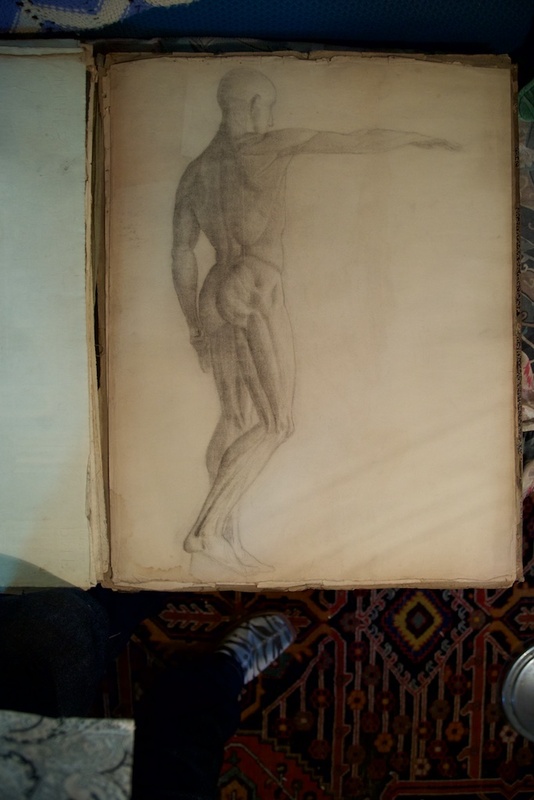 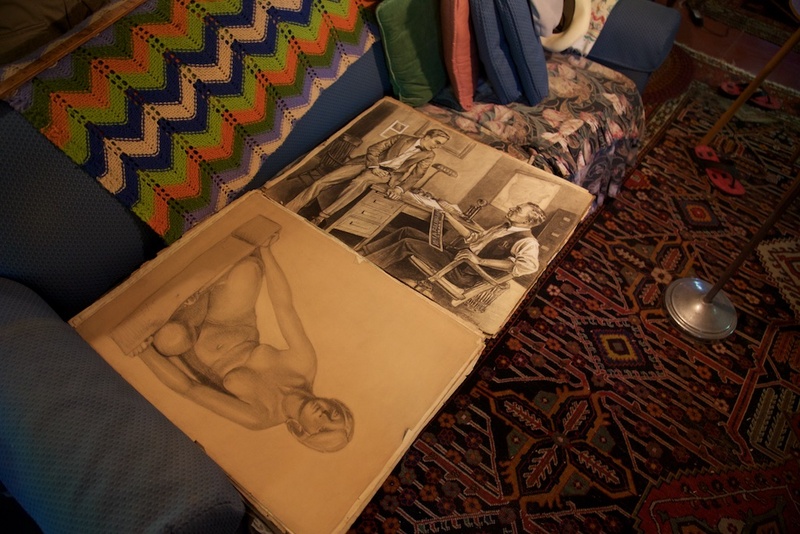 The nudes and studies are not dated but could be from his time as a student at the University of Oklahoma. 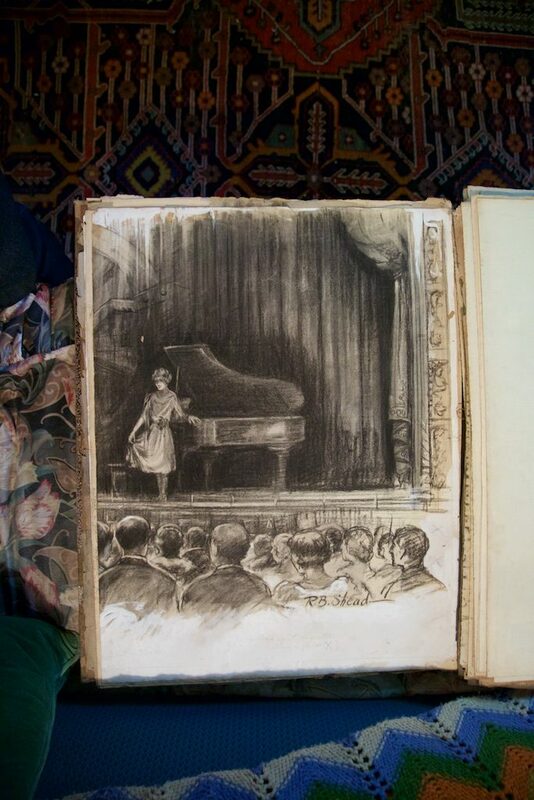 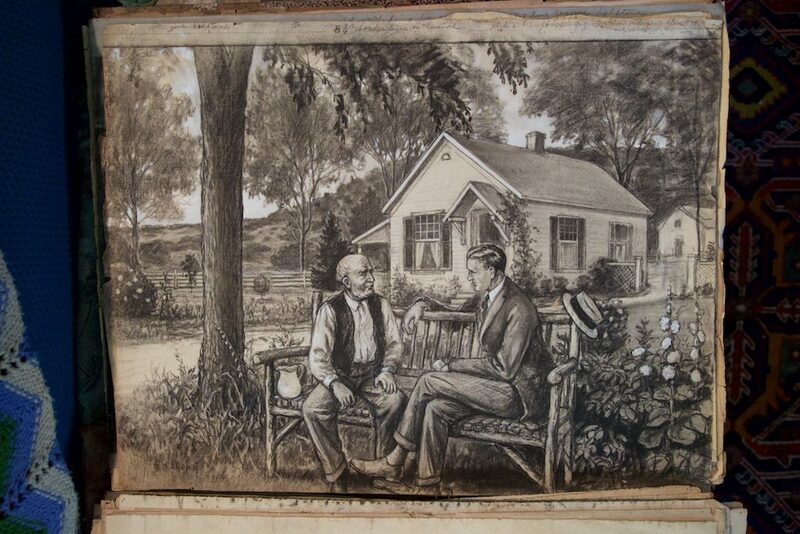 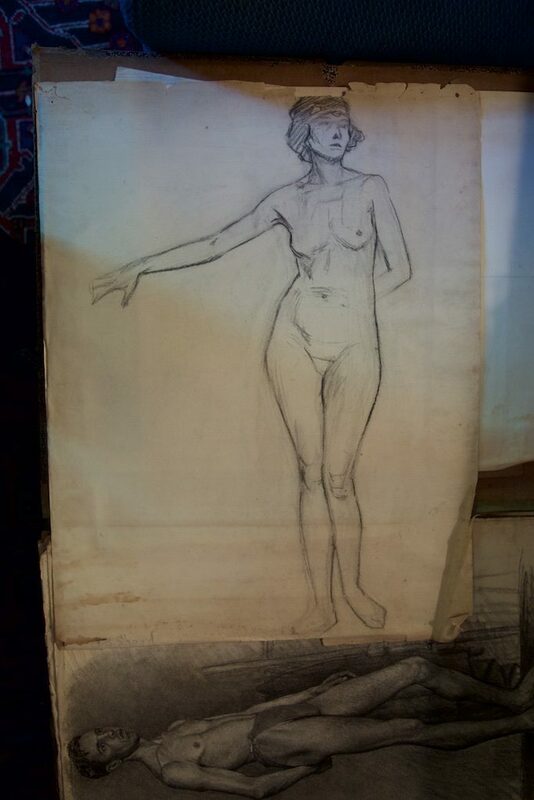 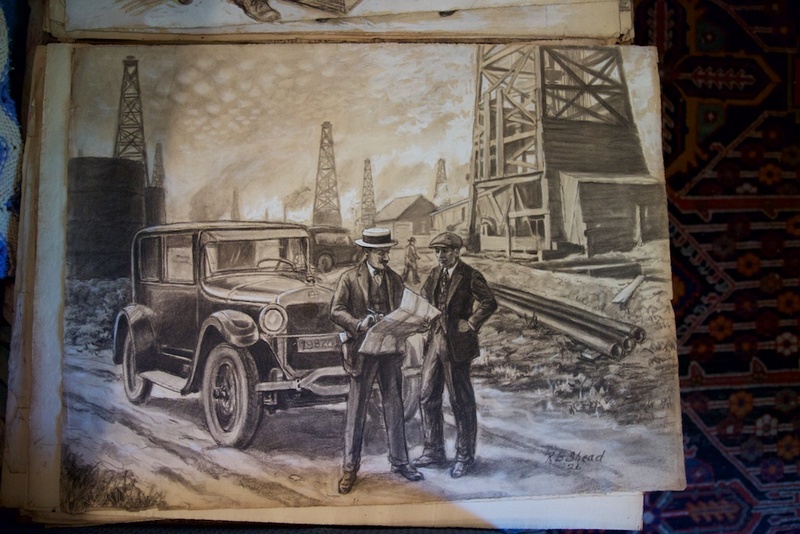 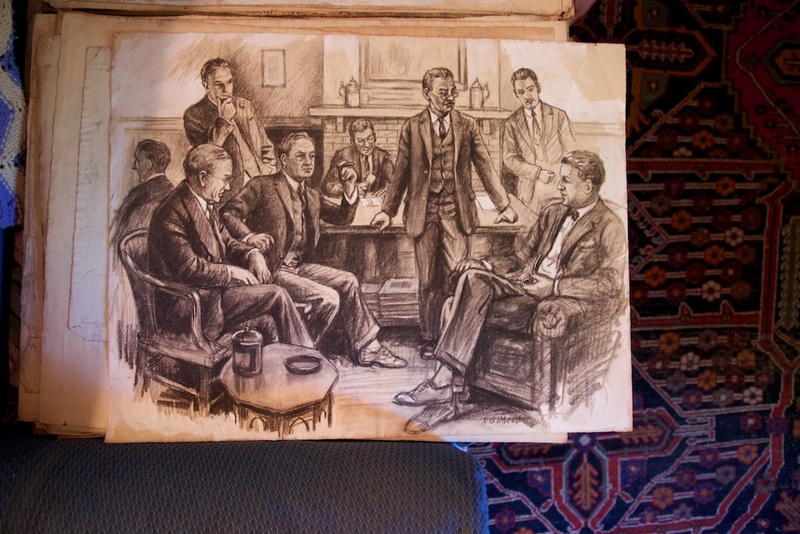 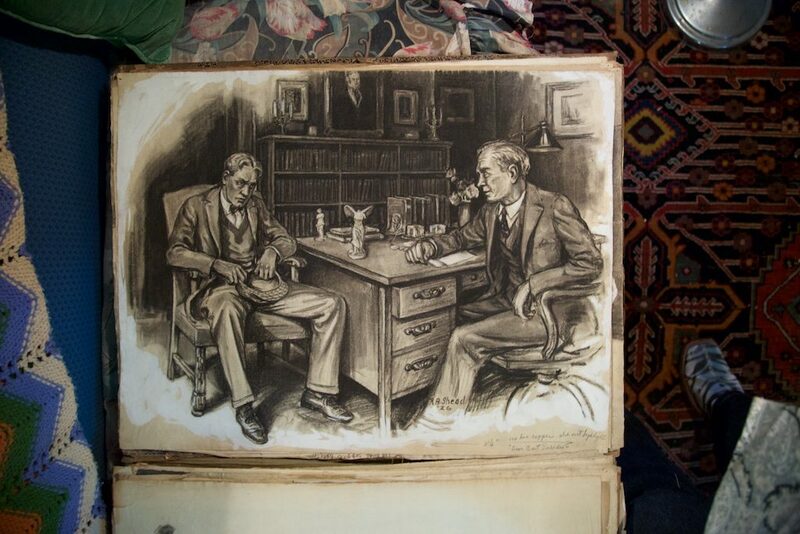 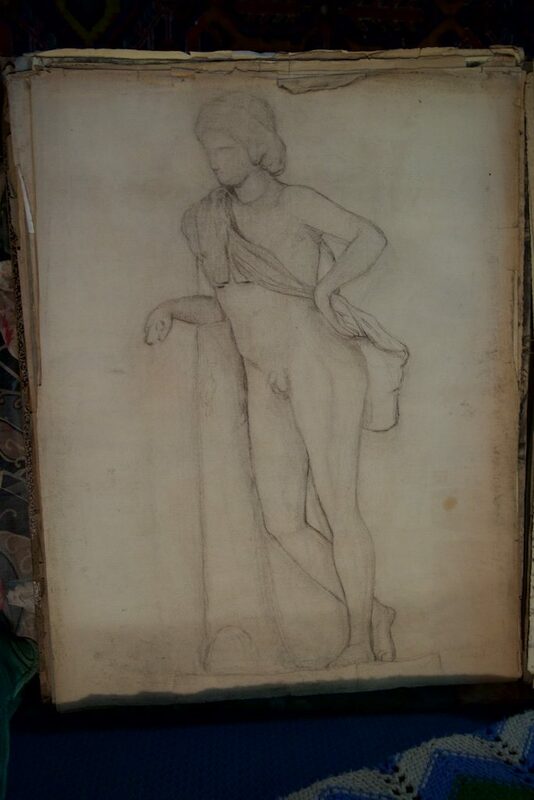 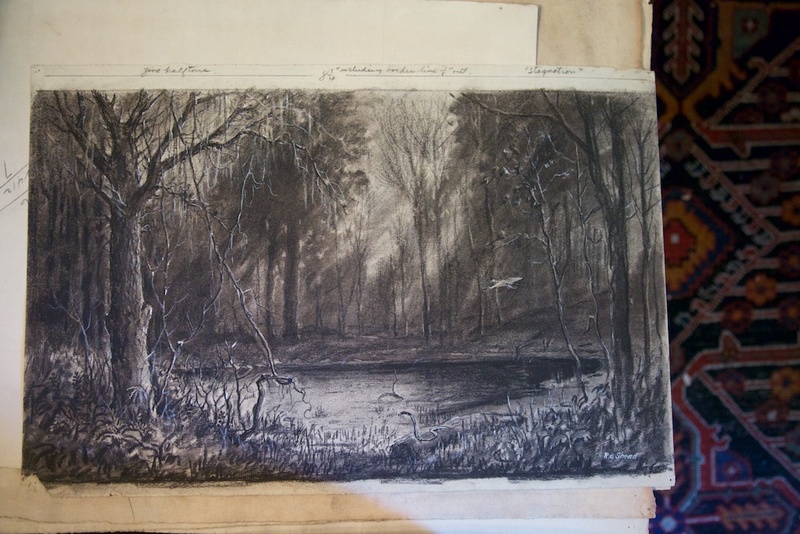 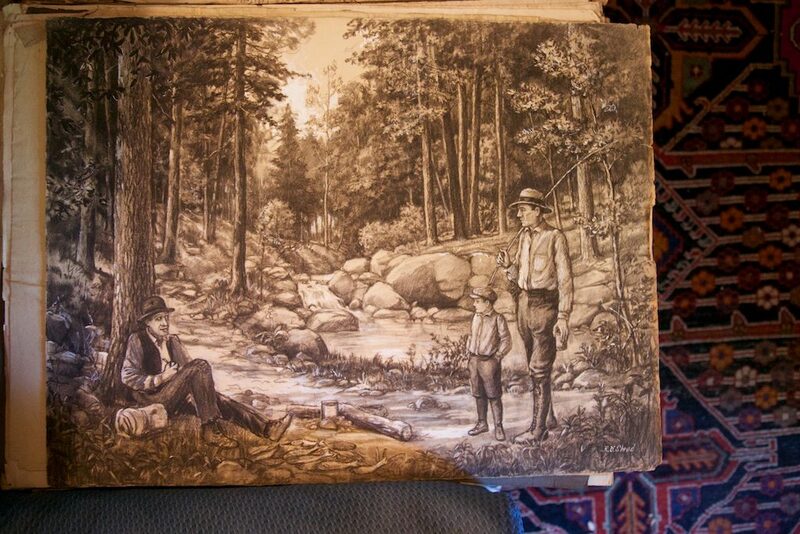 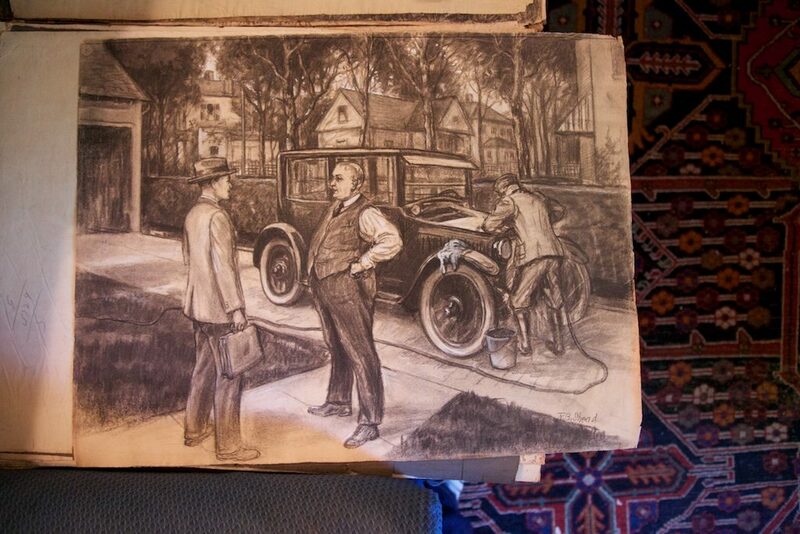 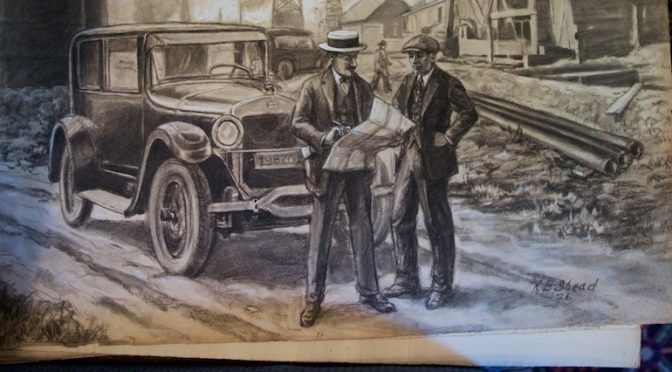 The earliest dated piece is from 1916 which was Ralph’s senior year at OU. 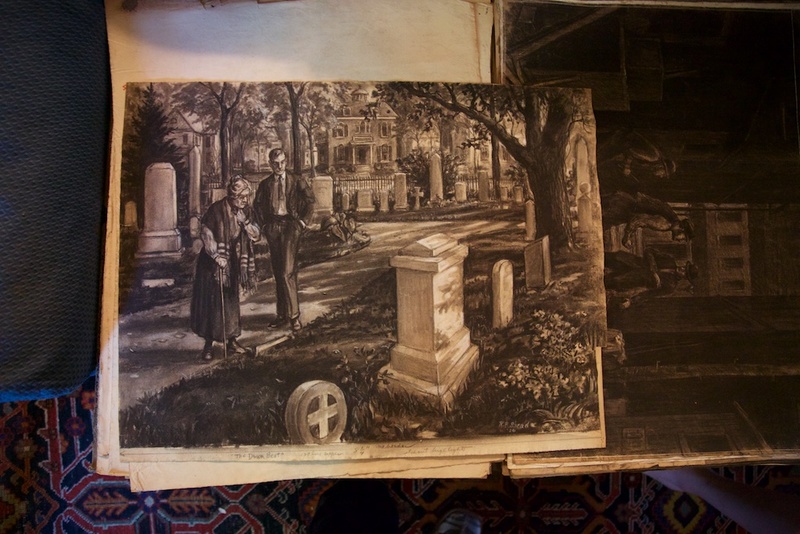 The architectural details (Cherokee Gothic) reveal that it is somewhere on campus. 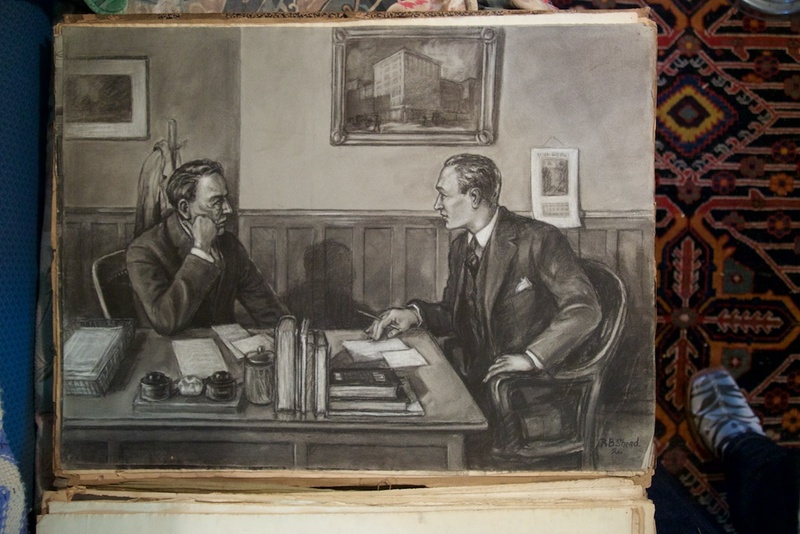 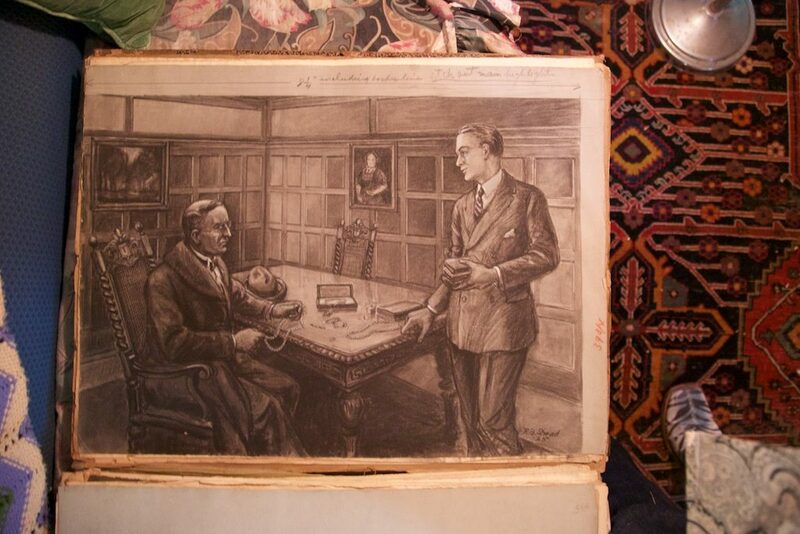 Most of the illustrations, when dated, are 1925 and 1926. 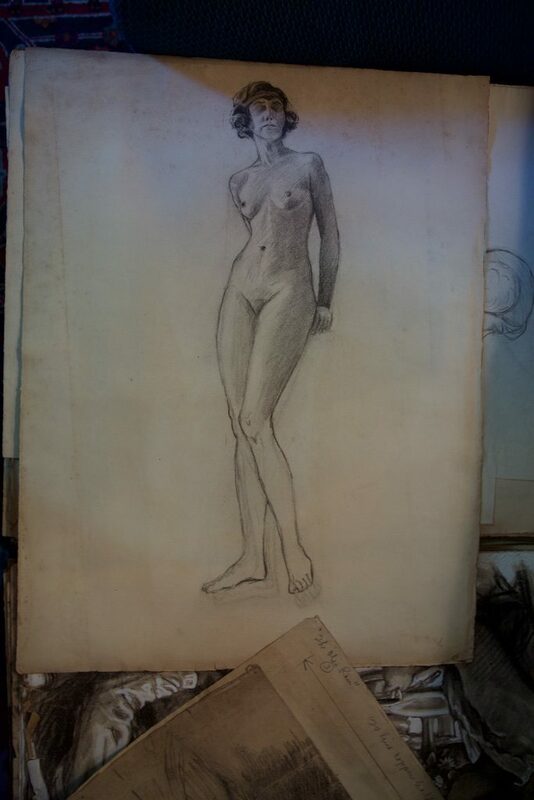 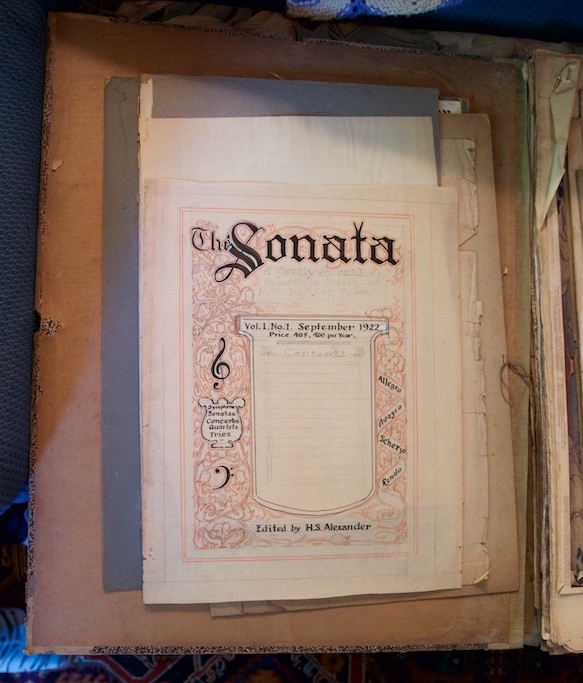 These make up the bulk of the portfolio, which, incidentally survived the house burning down in 1937. 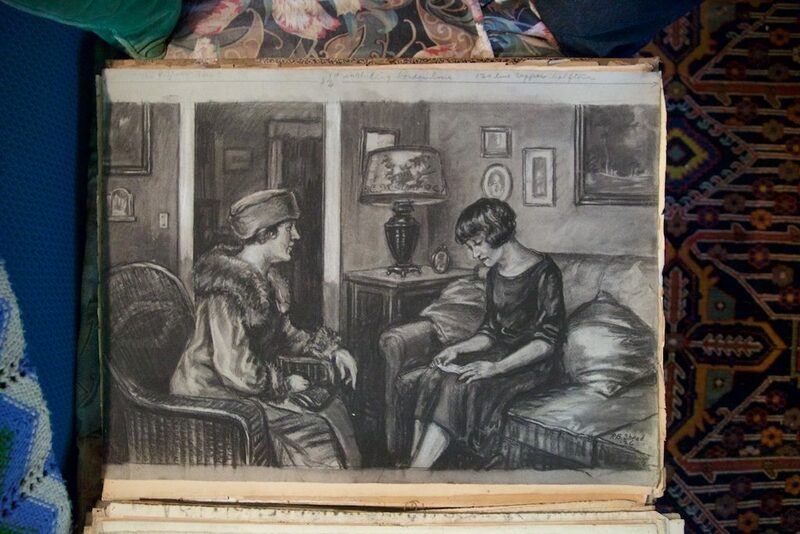 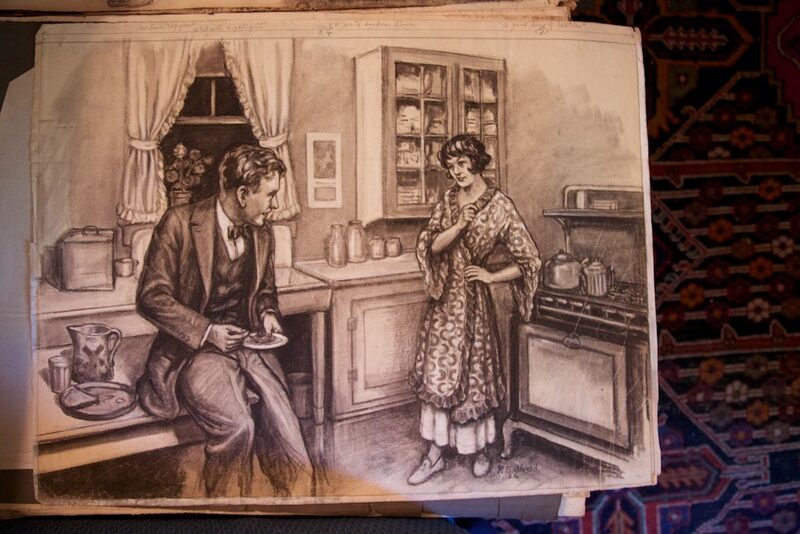 Flipping through these huge (18×24 inches) original illustrations was something that doesn’t happen every day, and all could have easily been lost 80 years ago. 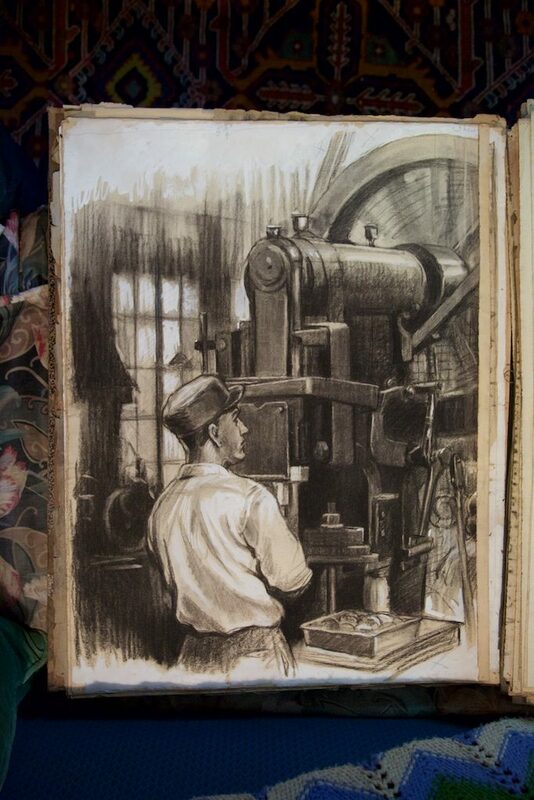 In addition to just being great artwork, the instructions for the engraver and printer were included on many including the finished sizes for printing, the largest being a mere 8.25 inches. 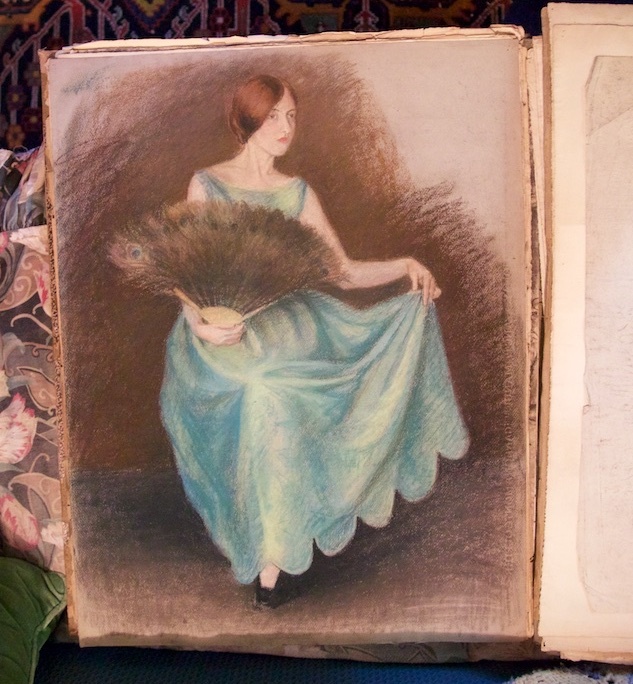 There a a few pastels and watercolors among the monotones as well. 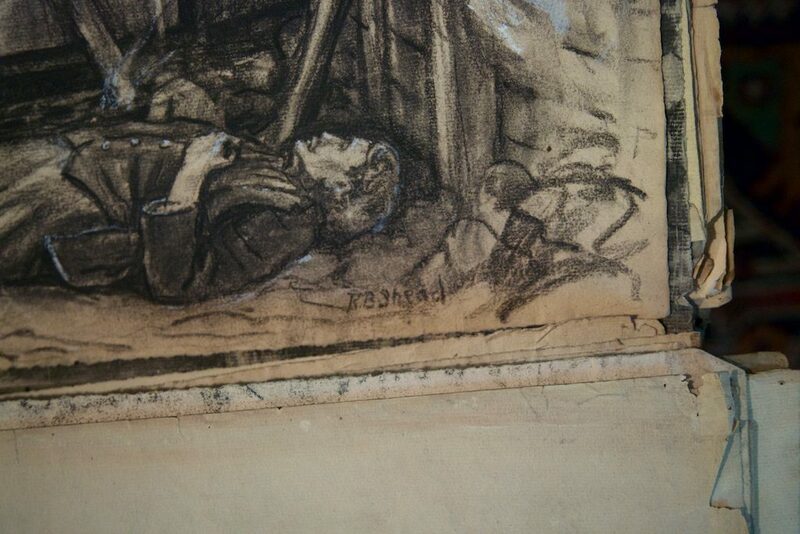 One of the watercolors ties back into Shead’s museum work. 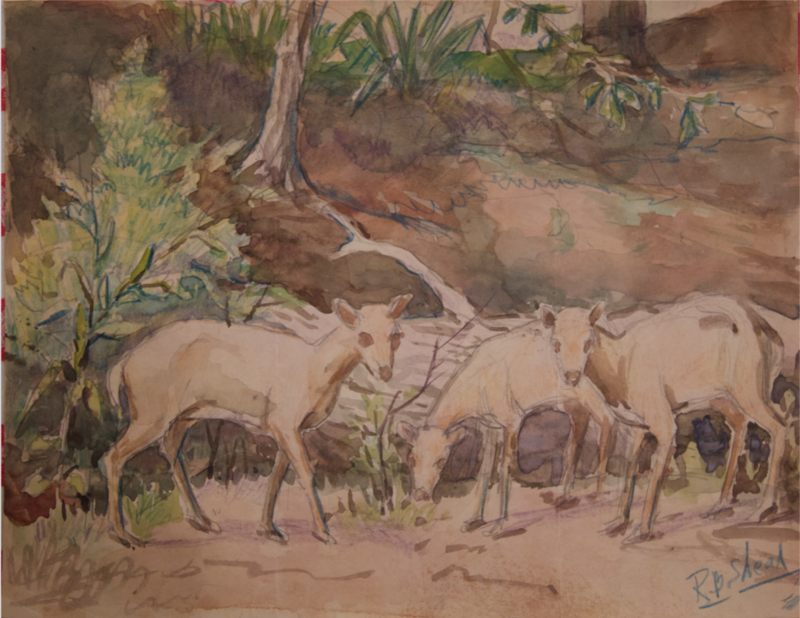 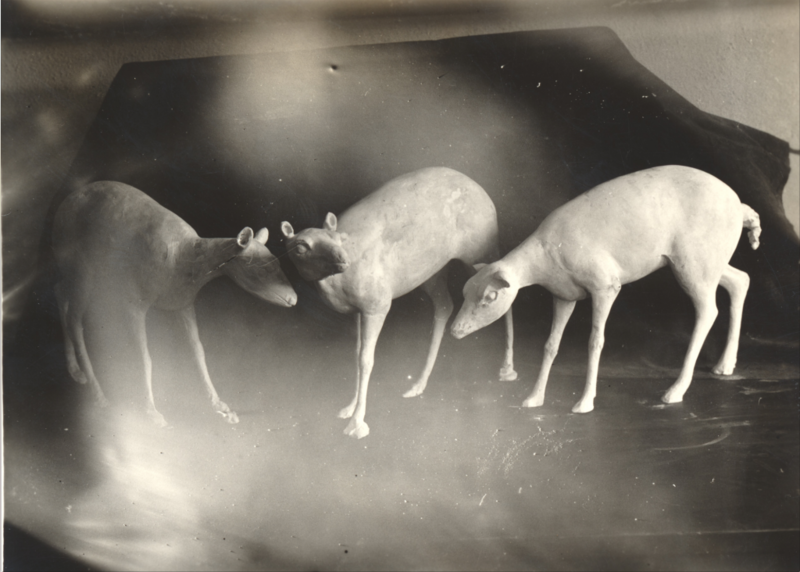 It is a watercolor sketch for one of the many dioramas he painted for the Stovall Museum at the University of Oklahoma starting around 1933. 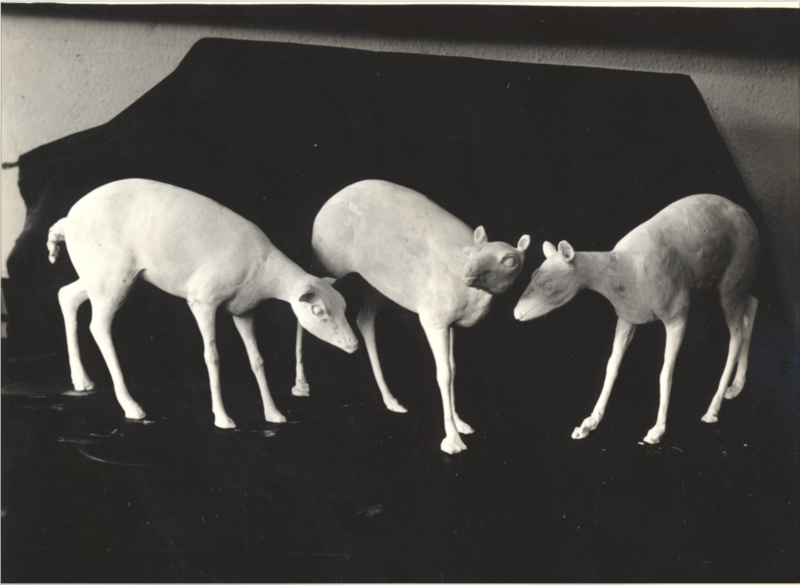 Shead created these Leptomeryx plaster models for reference. 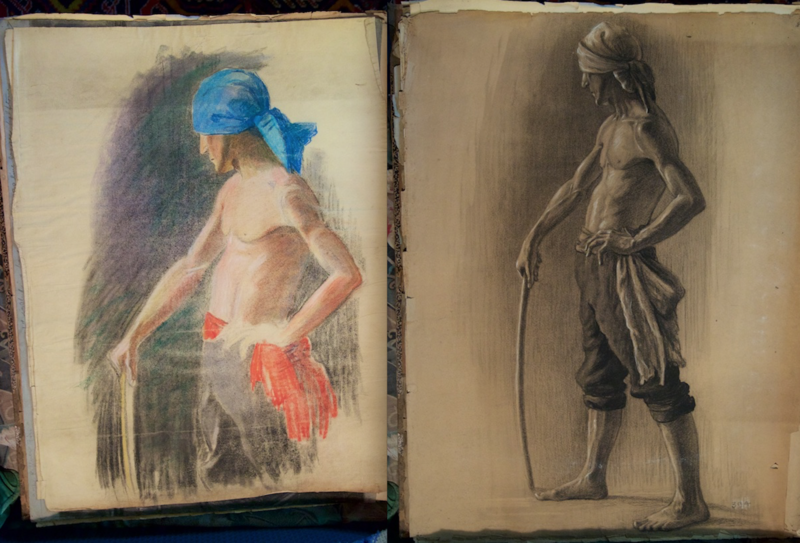 Finally, in the back of the giant portfolio was a “regular” sized sketchbook. 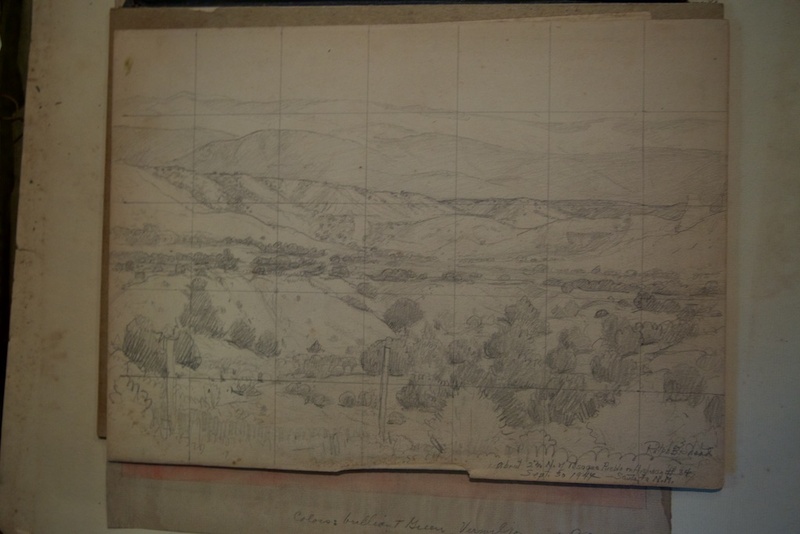 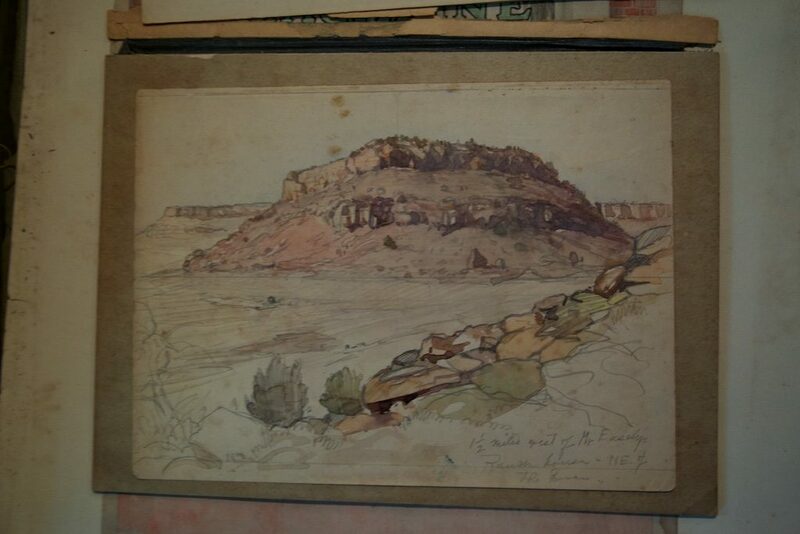 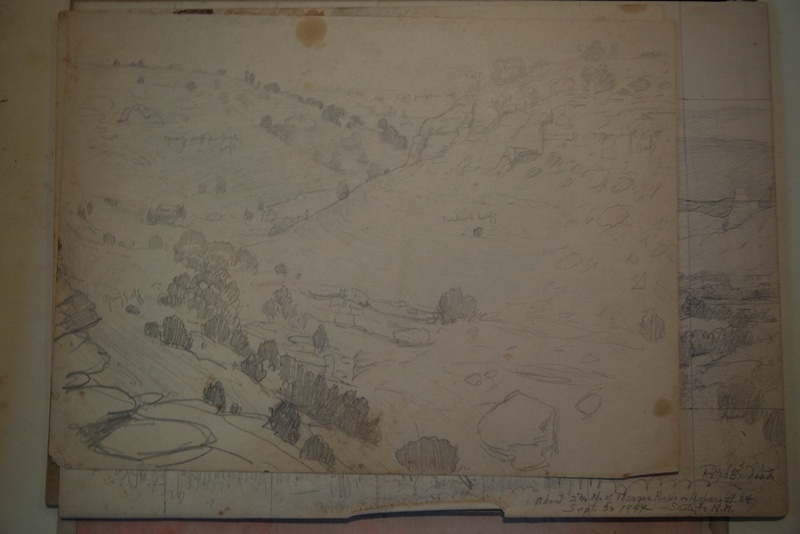 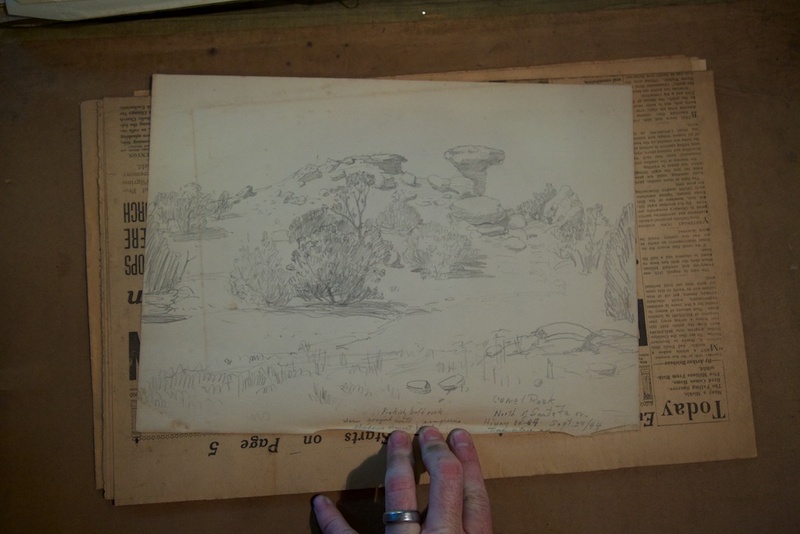 The remaining sketch pages were all landscape studies from the 1940s complete with the color descriptions for painting– things like “pinkish bluff” and “light purplish bluff.” Many of these are recognizable areas for anyone who frequents the Southwest. 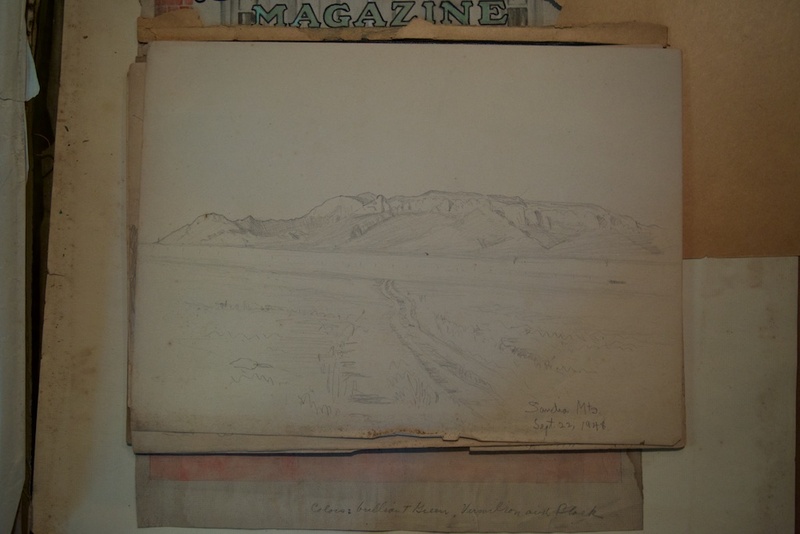 Most specifically the Sandia Mountains of New Mexico. 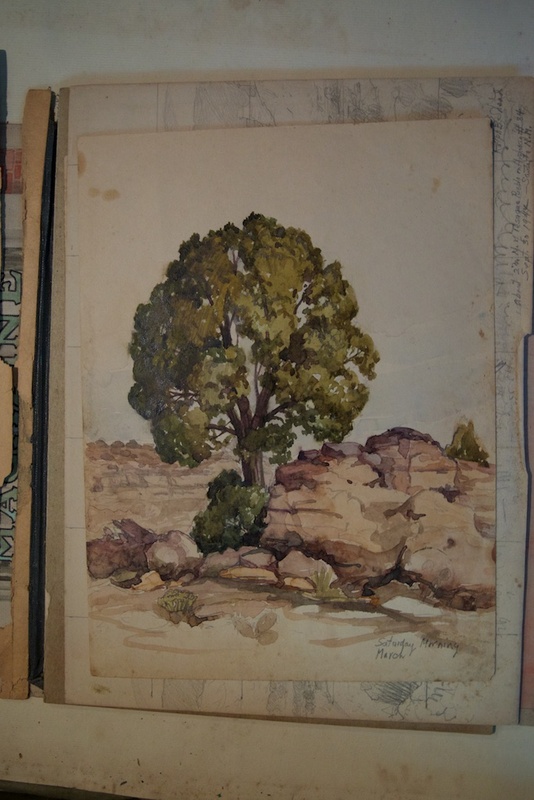 The Sandia Mountain sketch is dated September 1948 which means this enormous portfolio spans at least 32 years of work including Shead’s time as an OU art student, his work as a professional advertising and illustration artist, his return back to Norman and his unfathomable amount of artwork at the museum, and, likely, the personal landscapes that adorn the walls of his home. 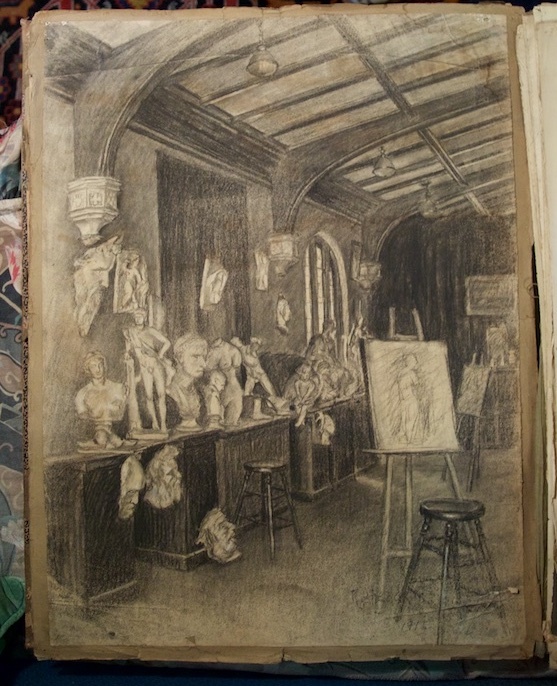 Such a corpus of work, in addition to the fact that nearly anything at the Stovall Museum with paint on it was his, proves that R.B. 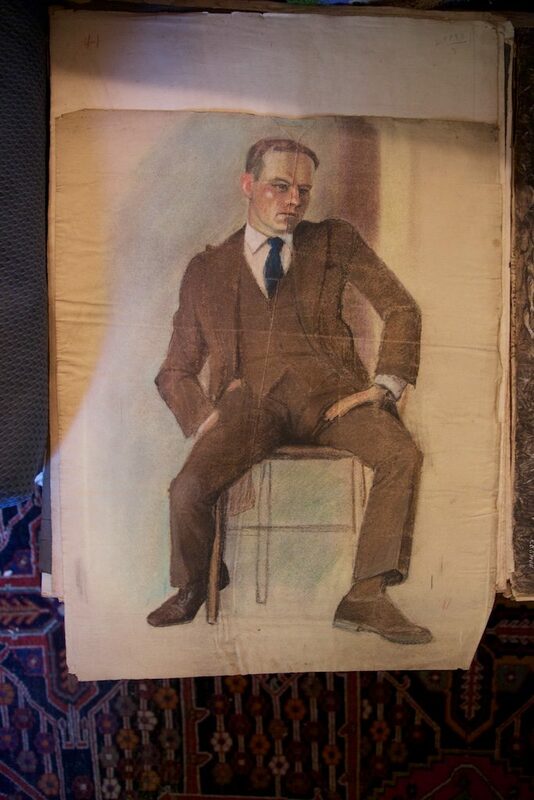 Shead is fantastically more than the few sentences dedicated to him in the “official” university histories.